From the garden. – Dirty wet dog , boats and sailing. Last night i dashed home from work a bit early having pleaded an urgent need to be at home by a certain time to receive the new boat. As it happens Ian the owner who was towing the boat over for me had an equally horrible trip to the one i had except that the main problems were endless delays with heavy traffic. Ian did eventually make it over just as the light was going and between the 3 of us manhandled the Devon Dayboat into the drive….more on that later. In the meantime i had a few hours to spare in between getting home and the new arrival so we set-to here to lift some of this summers crops. Last autumn i built the 2 new deep beds that i have been mainly using this season while deliberately resting the others. We only grow vegetables here in clean soil in the raised deep beds due to the fact that the site is over the top of the tailings from metalliferous mining and here that means the presence of tin and arsenic in the subsoil and debris. I built the 3 central deep beds when we first came here and they have been in production ever since so its about time they had a break. In a future post i will talk about the veg garden project in a lot more detail. 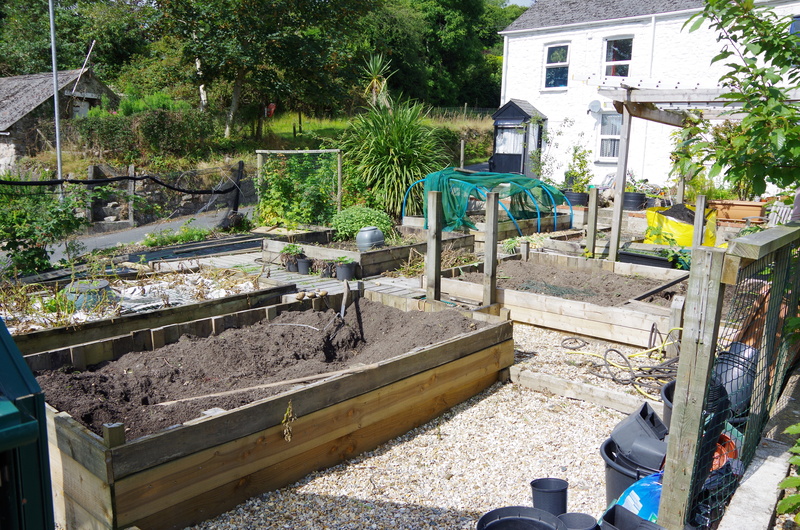 Anyway this year i only planted the 2 new beds and kept the planting really simple : just onions and potatoes and both have done very well. There are also ‘wild’ potatoes now in 2 other beds as i obviously left some behind last year so this weekend’s task will be to clear them all out, mulch them with some good manure and then cover them over for the rest of the year. Next year i will go back to a normal crop rotation exercise with the 5 beds which allows one to rest completely on a 5 year cycle. Now then : somebody seems to have parked a boat in the drive !